Evolution video: Understand how NAR and REALTORS® can evolve together to shape the future of our industry. See the proposed brand evolution come to life in multiple applications. Brand Forum Presentation Slides: Take an in-depth look at the research process and design development, along with best practices in brand evolutions from world renowned brands like Starbucks, Apple and P&G. 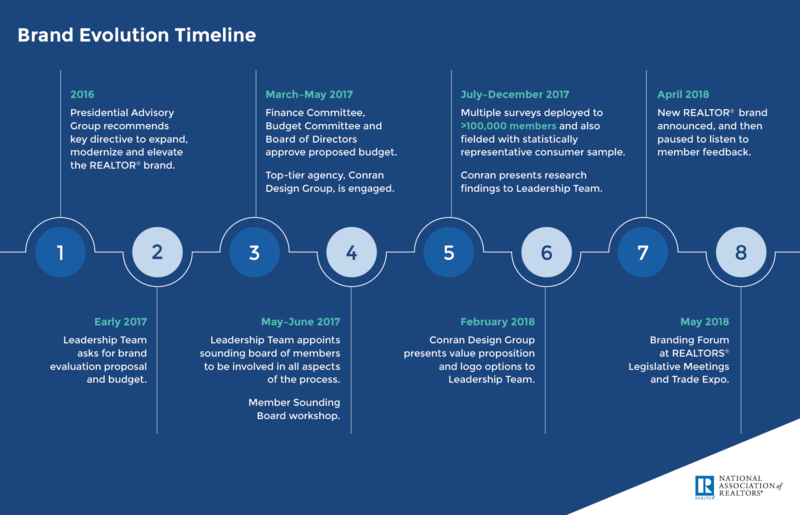 See how the proposed brand system unifies, enhances and simplifies the REALTOR® Brand and launches us into the future. We want to hear from you. Send us your questions and feedback at brand@realtors.org. Here is some additional background on the approach and process that may help answer many of the great questions you’ve already posed. 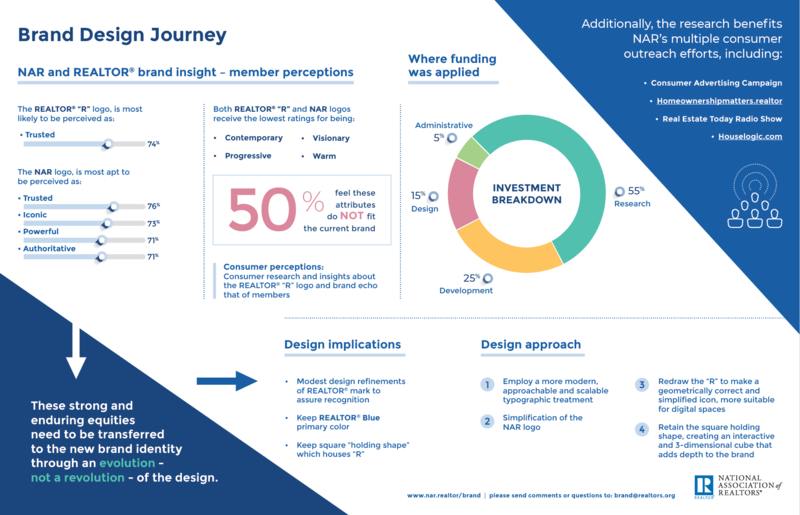 For a logo such as NAR's that has tremendous existing equity earned over time, design changes must be thoughtful and always measured against: preserving recognition in the marketplace, transferring equity from the existing logo while still modernizing and contemporizing the design, pointing to a future that is relevant and sustainable, and always striving to create low levels of disruption. If the logo were to have been radically redrawn and its core color were dramatically changed, the logo would fail on many measures, some that could hamper business. The roll-out of this work truly enables the REALTOR® brand to better compete and thrive in the marketplace in a way that is clear, credible, and compelling, while leveraging equities that NAR has earned over the past 45 years, and evolving our brand so that we can continue to lead the real estate industry over the next 45 years. Retaining and modernizing the "R" letterform, while keeping it recognizable, was essential for this project as the "R" is a foundational part of the NAR brand. We explored countless designs related to the "R", from modest change to more revolutionary change. Ultimately, the "R" was redrawn and housed within a new cube, which itself is an evolution. The new cube is an evolution of our 45-year old blue square, which is also a key part of the NAR brand. Moving the blue square from a flat holding shape to a more dynamic cube allowed the brand to come to life with depth and perspective. It also provides the ability to animate the logo and incorporate movement into the brand, while maintaining relevance in our digital world. The use of our REALTOR® blue color continues to be a primary part of the brand, as it telegraphically communicates the NAR brand. While a color change to the logo was considered, after a full marketplace audit, a move away from this iconic color would create high levels of disruption. Many would ask the question: "where is my blue logo?". It is important to point out that the existing logo had limitations that have never been addressed, which do not lend well to its use on digital platforms or at minimum size requirements. This is evident when the logo is reduced to small sizes, where it can become illegible. In addition, the outdated typography of the current NAR logo is very dated and was replaced with a much more modern and widely used Monserrat typeface, which holds up well on any type of communication or digital platform.